SWF to GIF Converter File Formats Supported. Flash files with SWF extension are commonly used by many website owners and designers to display animation because they can be easily embedded in webpage. As for GIF, featuring small size, it can also support animation as Flash does. So, many people want to convert SWF to animated GIF to make it easier to play on any device they want due to potential problems with the SWF Flash files, like, compatibility. But here comes a problem how to convert SWF Flash file to animated GIF directly? Just follow tips below, and we will introduce you a good program and guide you how to do it easily and quickly. SWF to GIF Converter is a powerful program to generate GIF animation file of any resolution and frame rate from the given SWF Flash file, including Flash file with complex structure and Flash with a single frame. It is also capable of converting SWF to GIF and other image formats like BMP, TIFF, JPEG, PNG, and ICO. In addition, user can convert the entire SWF into an image sequence in batch mode with ease. Download SWF to GIF Converter and run it, then the main interface will pop up. 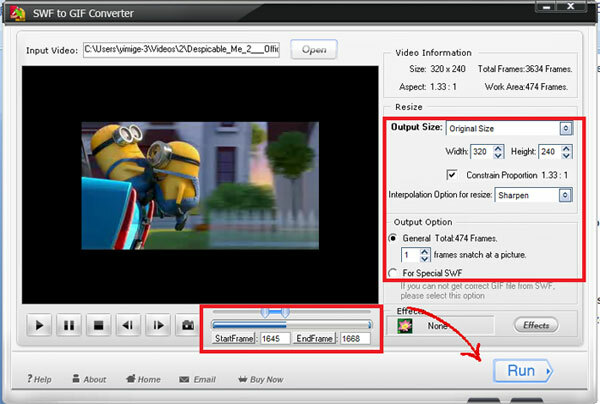 Import source Flash video file by clicking “Open” button. Step 2 Modify Default Settings to Adapt to Your Own Need. Set starting frame and ending frame to select the certain part for output instead of the entire video. Reset output file size and specify output frame rate. You can resize file by selecting “user-defined”. Specify output mode and add special effects. Hit “Run” button on the lower right corner of the main interface, then you will come to “Output Setting” interface. Specify output folder and image format. Press “Run” on the “Output Setting” interface to start converting Flash SWF to GIF effortlessly. SWF to GIF Converter is capable of converting SWF (including Script SWF) to GIF animation flawlessly at a very fast speed. It preserves quality and frame rate just as same as original video file. It is also handy for user to add special effects, like, brighten, invert, emboss, etc, and resize the GIF animation through “Resize” and “Effects” option. The unregistered edition will put words on output images. Copyright © 2019 AoaoPhoto Digital Studio. All rights reserved.